Seabirds (black-browed albatrosses and giant petrels) follow a trawler in the Falkland Islands, scavenging discards. 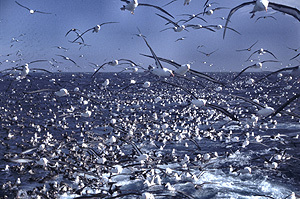 The photo below shows albatross and other seabird bycatch from a pelagic longline fishing vessel operating in South Africa for a period of one month in 2005. Photos by Ben Sullivan (above) and Peter Ryan (below). 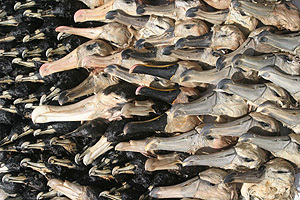 Huge numbers of fish, seabirds, and other marine animals are routinely killed and discarded after being inadvertently caught during fishing operations. Known as marine bycatch, this problem is an ongoing challenge to the fishing industry, regulatory agencies, and conservationists. One recent proposal would compensate for bycatch by reducing other impacts on affected species, but a new analysis suggests that this strategy could end up doing more harm than good. Note to reporters: You may contact Finkelstein at (831) 459-3902 or myraf@ucsc.edu.